Last week I had three exams, this is the most amount of exams I have had over the past three years in exam period. I had to endure Monday, Wednesday and Friday exams and then had a weeks gap before my last one. Dealing with exams is never easy and if the exam timetable gods don’t favour you then it’s even harder. 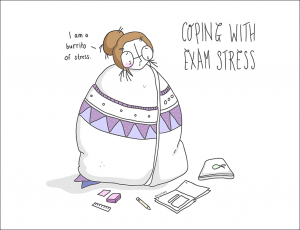 To make matters worse my friends and housemates had less exams or more spaced out ones, so I found myself encased by this stress on my own, and that is the point which I would like to emphasise. You’ve got to do this on your own. Dealing with the pressure of assignments and exams is just a ramped up version of what most of us experienced in school, but the thing that gets to me the most is everything else. When you had exams in school your parents probably cooked your dinners, and all you had to worry about was the tests. At Uni I’ve found myself worrying about paying rent, the bills, signing a lease for a new flat, what to wear for graduation, postgraduate loan application and the stresses of moving out all throughout exam period, this and the fact that you still have to cook clean and have a social life is why university can feel exhausting at times. The key to dealing with all of this is, like most things in life, solved by communicating and organisation. Talk to your friends, housemates or even family about what is getting to you, because as hard as it is, you have to push other worries away and focus on your exams, everything else can wait. I’ve found that in third year I’ve come to focus on exams and write a list of everything else I need to get sorted or I’m worried about. As obvious as it sounds when it comes to revision the key is preparation and repetition, I found myself making revision cards with theorists names on them weeks in advance (mostly because I had three exams in one week) I went over these cards every day until I had remembered all of them, using acronyms or word association to remember up to 60 historians/theorists in each exam. 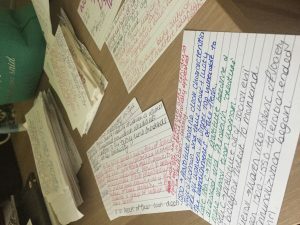 I certainly didn’t use all of them but having that wider spread of knowledge means that I could fit what I had learnt and still answer the question. Whatever year of Uni you’re in exams are stressful however I cant help but feel the mounted pressure this year, it’s as if it’s all come to a point, surprisingly it was quite motivational, every time I didn’t want to revise I’d just think, I haven’t come this far to give up now. I’ve now finished all my exams and the sense of relief walking out of the last one was next to euphoric, it’s been one long road, and definitely one I will never forget, University has shaped me as a person, lame as it sounds but I feel like I’ve found who I am here, or at least become comfortable with who I am. A chapter ends and another begins in September!